Last month, out Middle School students became the Experts as they were talking bout Judaism to 7th grade classes from Michigan, who were studying World Religions. Our students asked the class from Michigan if they had any Jewish students (which they didn't) and if they knew any Jews personally (which they didn't). There was one Muslim student in their class and our students immediately asked her questions about Islam. After the Skype call was over, our students expressed interest in contacting and connecting with other Muslim students in order to learn more about their religion. The first Skype call was set up with the Banadiir Academy in Minneapolis, Minnesota. During the call, which lasted almost an hour, I witnessed what I am defining as a transformative learning experience. Students had a list of questions prepared about Islam. In the beginning (first 20-30 minutes), the conversations felt very scripted as students read and answered the questions off their list. That changed when students from Minnesota asked "Do you want to see how we pray?" There was an enthusiastic "Yes" on our end of the screen. 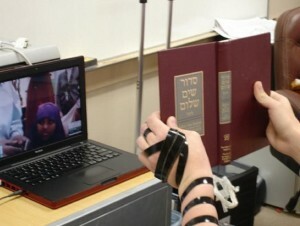 As they were watching and listening to the explanation, one student ran to get his Tallit and Tefillin to show and demonstrate. I could tell that the wheels in the students' minds were still turning as the Skype call ended. After leaving the "Social Studies" class and heading over to their next period, Mrs. K, the "Language Arts"teacher jumped on the opportunity to build on this learning experience. She asked them to take the notes they had taken during the Skype call and write a reflective blog post about their experience. Find an excerpt of their posts below with links to their classroom blog and a short 90 second video of the Skype connection. I believe that not only should we Skype with people of different religions, we should want to Skype with them. The experience is eye opening and very informative. I now understand many things about Muslims that I did not before, and they probably learned things about us that they did not know before. This was fun and a great learning experience. If you are someone who is ready to learn about new things and people, you should try Skyping, too! Hopefully, technology can bring us together so we can see the good and the similarities in each other, instead of the differences. There are so many disagreements with our cultures. Those disagreements break the chains of our friendships. We need to take a stand and connect the chains back together. They are great people; some other religions like Catholic and Hindu, and not just us, need to Skype with them. I want to write letters to the Somalian Muslim students that my class and I skyped with, like “Pen Pals”; and maybe, just maybe, we can become close friends – you never know. I am Jewish and I just skyped with kids who are Muslims. From this experience, I realized that we have more similarities than differences. We, and people of all religions, need to put our differences aside and look at our similarities.[...] If we take the time to get to know religions other than our own we will understand, just like I did, that we can get along. So, my one wish for the world, is that one day we will have peace – it is up to every one of us, and can begin with a single conversation. Rational hate would be us Americans hating the people who were behind 9/11. Irrational hate would be us hating every Muslim we see, just because they are Muslim. What is the reason behind it? It’s the same as saying you never want to speak to a German again because of the Holocaust. That person could be totally against Hitler. Never judge a book by its cover; those who do may miss the best read of their life. It was just a normal morning in March. I walked through the school doors ready for my daily classes: Hebrew, math, science, English, and history. Today, though, I learned so much more than those subjects. At 10:00 A.M., we dived into the beliefs and traditions of a different religion, Islam…via our modern technology, Skype. [...] Over all, this was a fantastic experience that many people would probably never get to have. We shared information about ourselves and learned about a different religion. Hopefully, one friendly interaction at a time, more and more people will begin to realize the similarities connecting people around the world.